Once again, Anne and I want to thank you for listening to the Home Again Podcast! 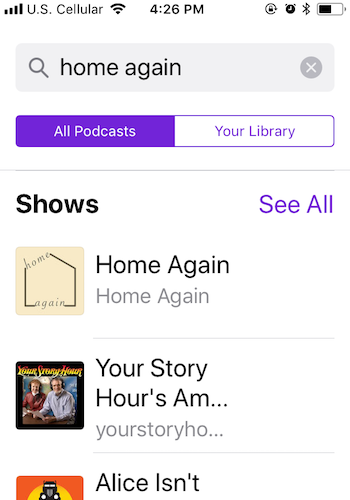 If you want to subscribe to Home Again from your iPhone on iTunes, this post offers step-by-step directions. It also explains how to rate and review Home Again if you feel so inclined. 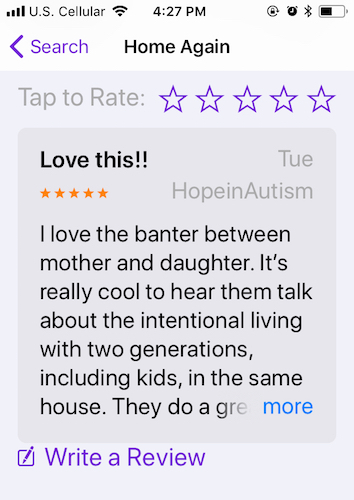 We are ever-so-grateful to those who rate and review Home Again since ratings and reviews are what what makes iTunes take a second look at and promote the podcast. 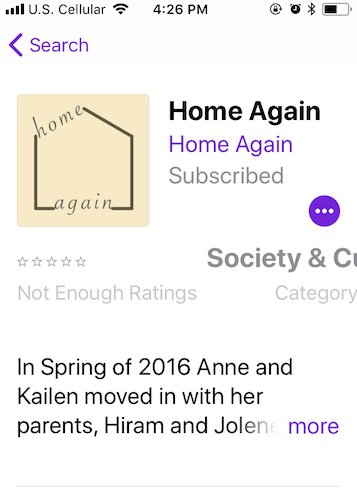 With the begging out of the way, let’s talk about how to subscribe to Home Again from your phone. If your phone is an Android, this link tells how to do it: https://www.digitaltrends.com/mobile/how-to-download-podcasts/. The post also explains why the popularity of podcasts is growing. Now, here’s how to subscribe via an iPhone. Step 1: Find the podcast app icon on your phone. It comes as standard equipment on iPhones and looks like this. 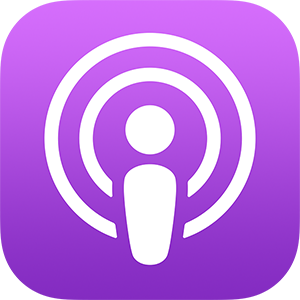 Step 2: Tap the podcast icon and a new window will open. Scroll to the navigation bar at the bottom of the screen, and tap on the search icon, which is the magnifying glass to the far right. After you tap on the search icon, this window should pop up. Step 3: Type “Home Again” in the search bar next to the magnifying glass at the top of the page. 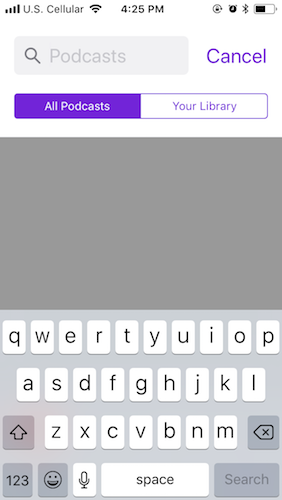 Next, tap the “Search” button to the bottom right of the keyboard. A new window will appear, and Home Again should appear first in the search results. Tap on our cute logo or on the words “Home Again” next to the logo. Step 4: After you tap, this window will appear. The only difference between what’s in the picture and what’s on your phone is this: the picture here says “subscribed” next to the logo because I’ve already subscribed. Your phone will say “Subscribe” because you haven’t yet subscribed yet. Step 5: Tap on the “Subscribe” button and the button will change to “Subscribed,” so your window looks like the one above. 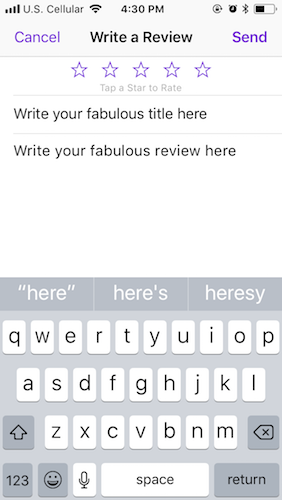 Tap on “Write a Review,” a new window will appear. When you tap on the “title” line a keyboard will appear at the bottom of the screen. 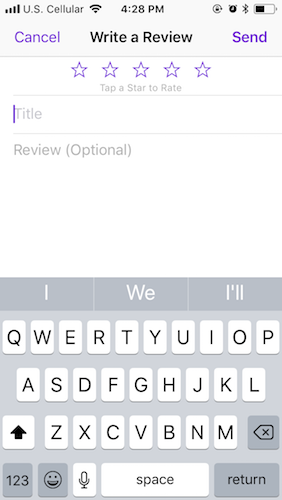 Step 7: The directions in the window below show where to write your title and review. 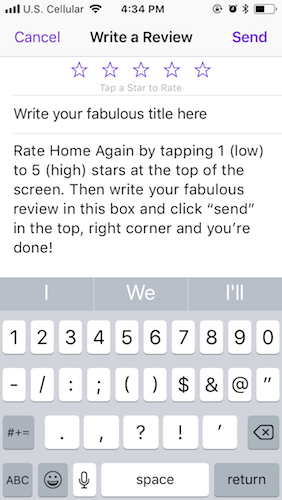 Step 8: You can also rate Home Again by tapping stars at the top of the screen at any point in the subscribe and review process. The window below tells you what to do. That’s it. You’re done! Thank you for taking time from your day to subscribe to Home Again and to provide feedback. If you have any questions, leave them in the comment box and we’ll get back to you!